The Stratford–upon-Avon Bee Improvement Group (BIG) was formed in 2006 with the aim of improving the local honeybee population, at that time the local bees had a reputation for being bad tempered mongrels which produced an excessive number of swarms. 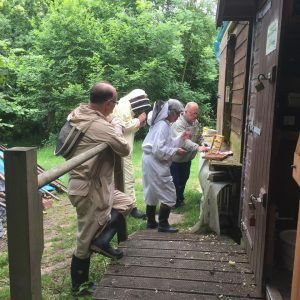 BIG has the support of the Association and the use of the Association apiary for demonstration purposes, queen propagation and nuclei production for members. The inaugural meeting of BIG decided to concentrate its efforts on the preservation of the native honeybee Apis mellifera mellifera (Amm), which is the bee most suited to the climate. Members of the Association are encouraged to support the aims of BIG by stocking their hives with bees /queens supplied by the group and refrain from the use of imported queens, which undermine the efforts of the BIG and lead to further mongrelisation of the local bees. The aim of BIG is to continue our efforts to improve the Amm characteristics of the local honeybees in the District for the benefit of the Association members and expand our area of influence to other like minded beekeepers.